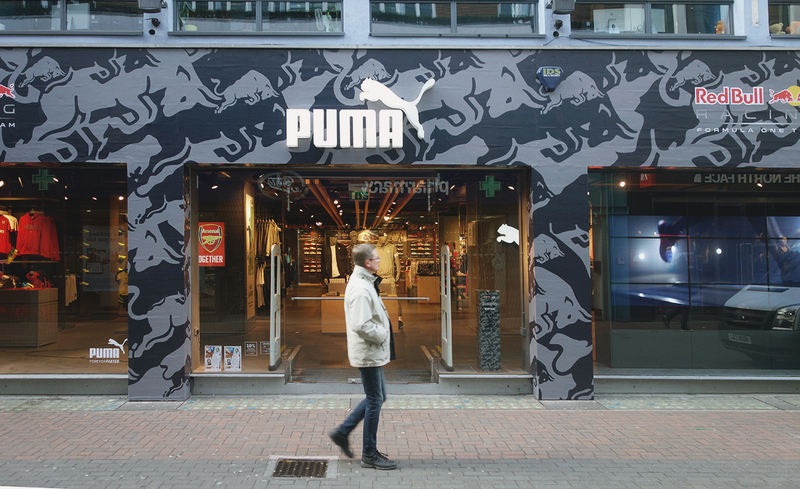 The Graphical Tree printed and installed exterior graphics to cover the entire Puma store in London's Carnaby Street. 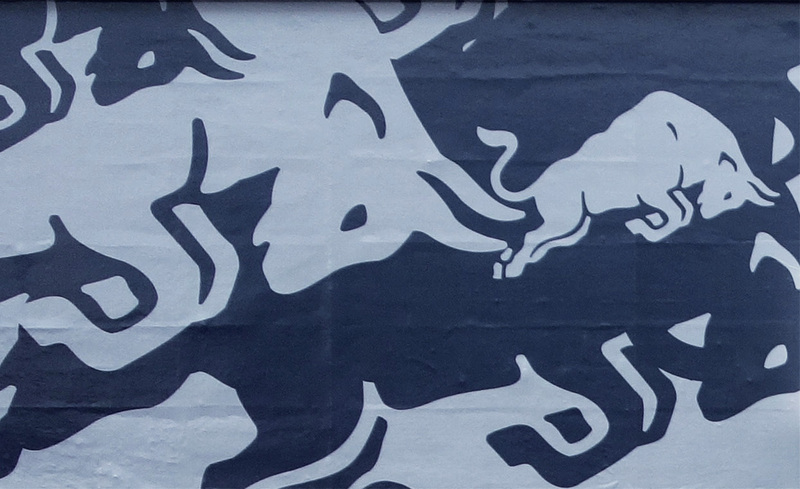 The project was for a promotional collaboration between Red Bull Racing and Puma and certainly caught the eye. 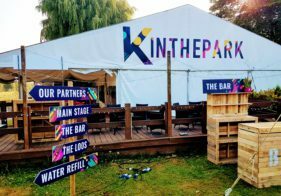 We were asked to work on the job by long standing client, creative events agency, Innovision. It was essential to undertake a site visit before putting together a quote for the job and artwork was created. A job like this is always likely to have more than a few production considerations. Not only does the print need to be applied outside, its also being fitted to the building facade. In this case, large stone bricks. 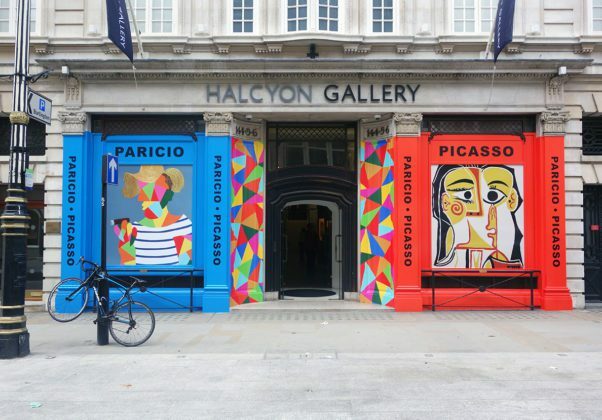 The artwork needed to be created to accommodate wrapping the graphics around the shopfront returns and overhangs. Working closely with Innovision we are able establish all the important elements of the job. This includes how long the graphics will be in situ for and any technical issues, such as working with existing signage. We are also able to make sure the print and installation runs smoothly. We're able to advise on how to set the artwork and where to include bleed. This information is based on knowledge gathered from the site visit and how the graphics will be installed. 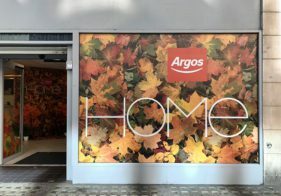 The graphics to wrap the shop facade were printed to a permanent outdoor self adhesive vinyl with anti-graffiti seal. This provided a durable material for the Great British weather which bonded safely to the building surface. When applying graphics to stonework it's important to use professional installers. An experienced team of fitters knows how to apply the vinyl to fit to the textures of the stone. Using a heat gun, they can stretch the vinyl over the building curves ensuing the graphics still smoothly. Along with the shop wrap we produced additional supporting print. These included large mounted graphics for inside the windows and vinyl decals to the glass for the event messaging.